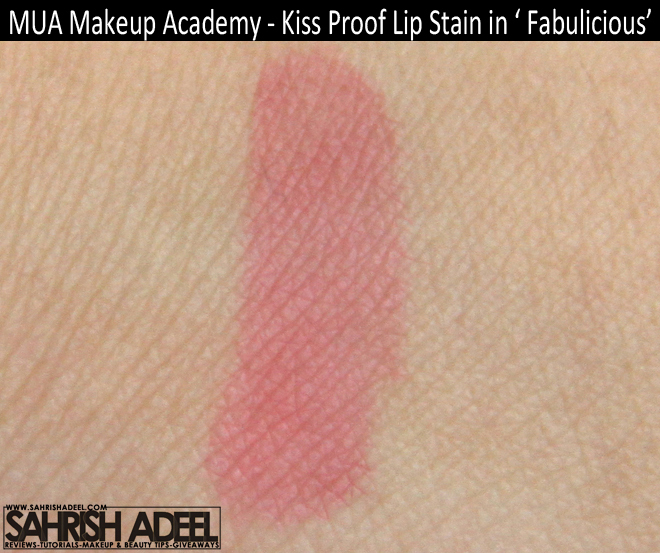 MUA Kiss Proof Lip Stain in Fabulicious - Review & Swatch | Sahrish Adeel - Malaysia based Pakistani Beauty & Lifestyle Blogger! Being a lip gloss person, I also want the color to stay on my lips for longer hours which is obviously not possible with lip glosses. As soon as Makeup Academy launched Kiss Proof Lip Stain, I ordered the most neutral shade from the range. Is it really kiss proof? At last colour that stays with MUA’s Kiss proof lip stain, the answer to the problem of 'bleeding' lipstick and lipstick that disappears all day long. Kiss proof has a hydrating and waterproof formula which does not dry out your lips and is enriched with moisturising panthenol. Kiss proof is a felt tipped pen for easy application to create a perfect line and Kiss Proof Lip Stain comes in three natural tones that can be used alone or mixed to create a unique shade for your favourite colour. You can also use the stain as a base for your usual MUA lipstick or alone for a sheer lip enhancing colour or with Intense Kiss lip gloss. This lip stain comes in a market like plastic packaging. It has a stiff and fine applicator tip and comes in three shades. The shade I am reviewing today is called Fabulicious. This swatch has been taken on bare skin; without any primer underneath and this is only one swipe of this lip stain. A marker like plastic packaging makes this lip stain travel friendly. The tip is stiff making the application very precise especially on the edges of the lips and you would literally feel like you are using a marker. A highly pigmented formula with a mild scent that stains the lips really smoothly. It goes with full color onto the lips in one swipe. It dries really quickly and stays for over four hours. The formula is truly kiss proof and water resistant. There is no way it smudges or shifts onto your glass. However, I have noticed that it is not oil resistant at all. So if you eat anything oily that touches your lips, the stain is gone. It dries out the lips as it sets to either moisturize your lips really well prior to the application or use a lip balm afterwards like I do. I have way too dry lips and if I don't apply a balm over it, my lips look cracked. I don't think this would be much of a problem for people with naturally moisturized lips but I have naturally dry lips and I have to have a lip balm or a lip gloss on my lips most of the times. 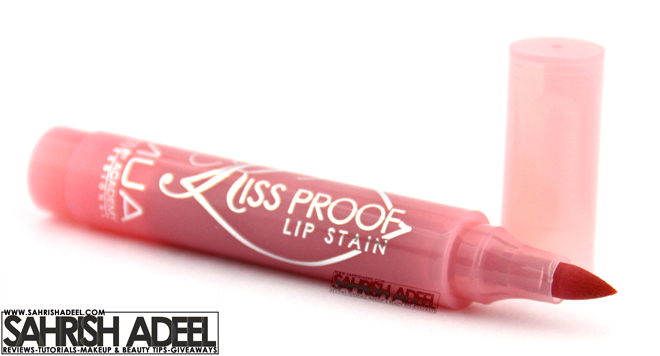 Kiss Proof lip stain has a good value for money and is suitable for all skin tones and ages. Overall, I am super in love with this lip stain and I really love to use it under my lip balm and also under my light toned lip glosses and lipsticks to make my lips look more youthful. Applicator with fine and stiff tip makes the application very precise. Stays for over four hours. Suitable for all skin tones and ages. Kiss Proof Lip Stain costs £3 and you can buy it from Makeup Academy's official website. They ship to the countries where you have PayPal service. In UK, you can find this brand on all drugstores. In Pakistan, you can buy it online from Just4Girls.pk. Do you like lip stains? Have you tried this one yet?